Scale: It is 63 miles from Long Eaton to Gainsborough and 23 miles from Sutton in Ashfield to Newark on Trent. 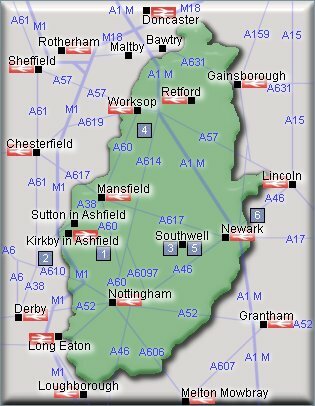 Airport indicated is Nottingham East Midlands. - Newstead Abbey, Newstead Abbey Park, Ravenshead, Nottinghamshire, NG15 8NA. Tel: (01623) 455 900. newsteadabbey.org.uk. - The Midland Railway - Butterley, Butterley Station, Ripley, Derbyshire, DE5 3QZ. midlandrailwaycentre.co.uk. Tel: 01773 747674. - Southwell Minster, Bishop's Drive, Southwell, Nottinghamshire. Tel: 01636 812649. southwellminster.co.uk. - Southwell Racecourse, Rolleston, Southwell, Newark, Nottinghamshire, NG25 0TS. Tel: 0870 220 2332. southwell-racecourse.co.uk. - Newark Air Museum Ltd., Winthorpe Showground, Newark, Notts, NG24 2NY. Tel: 01636 707170. newarkairmuseum.co.uk. Newstead Abbey, Newstead Abbey Park, Ravenshead, Nottinghamshire, NG15 8NA. Tel: (01623) 455 900. Newstead Abbey is a beautiful historic house set in a glorious landscape of gardens and parkland within the heart of Nottinghamshire. The Abbey's most famous owner was the poet, Lord Byron. www.newsteadabbey.org.uk. About 3 miles east of Kirkby in Ashfield. Papplewick Pumping Station, off Longdale Lane, Ravenshead, Nottinghamshire, NG15 9AJ. Tel: 0115 963 2938. A late Victorian waterworks with James Watt beam engine in ornate engine house with intricate brasswork and stained glass windows. Engines are steamed at Bank Holidays and other selected weekends. www.papplewickpumpingstation.co.uk. About 4 miles east of Kirkby in Ashfield. The Midland Railway - Butterley, Butterley Station, Ripley, Derbyshire, DE5 3QZ. The Midland Railway, Butterley is the home for all things associated with the Midland Railway. There is a standard gauge line which has steam and diesel hauled passenger trains. The main site at Swanwick has a museum and a large collection of diesel and steam locomotives. It is a day out for the whole family. www.midlandrailwaycentre.co.uk. Tel: 01773 747674. About 7 miles west of Kirkby in Ashfield. Newstead Abbey, Newstead Abbey Park, Ravenshead, Nottinghamshire, NG15 8NA. Tel: (01623) 455 900. Newstead Abbey is a beautiful historic house set in a glorious landscape of gardens and parkland within the heart of Nottinghamshire. The Abbey's most famous owner was the poet, Lord Byron. About 4 miles south of Mansfield. White Post Farm Centre, Farnsfield, Notts. NG22 8HL. Tel: (01623) 882977. Awarded Visitor Attraction of the Year (over 100,000 visitors) in the East Midlands Tourism Excellence in England Awards. A great day out for all of the family! Come along and make friends with over 3000 animals from the instantly recognisable to the more unusual including meerkats, llamas and wallabies. www.whitepostfarmcentre.co.uk. About 5 miles east of Mansfield. Southwell Minster, Bishop's Drive, Southwell, Nottinghamshire. Tel: 01636 812649. A superb Minster Church and Cathedral with a history going back almost a thousand years. The Norman nave is said to be one of the finest in Europe. See the new "Angel Window", search for 10 mice carved by Robert Thompson, visit the Chapter House to see the famous "Leaves of Southwell" and carvings of dogs, rabbits and pigs hidden in the foliage. The Southwell Minster Centre incorporates the Minster shop and Refectory, with audio visual display and Exhibition. www.southwellminster.co.uk. Location: About 6 miles west of Newark in the centre of Southwell. Southwell Racecourse, Rolleston, Southwell, Newark, Nottinghamshire, NG25 0TS. Tel: 0870 220 2332. The All Weather Track - The Fibresand track is a left handed oval of 1 mile 2 furlongs. The Turf Track - The turf course, used for both National Hunt and flat racing, lies within the all weather track. www.southwell-racecourse.co.uk. About 4 miles west of Newark. Newark Castle, Castle Gate, Newark, Nottinghamshire. Tel: 01636 655765. Newark Castle is located in the town centre, off Castle Gate, in a park that is open daily. Historic ruins dating back to the early 12th century. Fine Norman gatehouse. Location: In the centre of Newark. Newark Air Museum Ltd., Winthorpe Showground, Newark, Notts, NG24 2NY. Tel: 01636 707170. Newark Air Museum is located on the former World War Two airfield of Winthorpe in eastern Nottinghamshire. Its diverse collection of seventy  aircraft and cockpit sections cover the history of aviation, plus an excellent Cafe and an extensive Shop. Check for details of Special Event Days on the museums website. Open: Everyday except December 24th, 25th & 26th and January 1st; November to February daily 1000  1600 hours; October to March daily 1000  1700 hours (including weekends & Bank Holidays). www.newarkairmuseum.co.uk. Admission charges apply. About 1 mile north of Newark. Palace Theatre, Appletongate, Newark, Nottinghamshire NG24 1JY. Tel: 01636 655755. The Palace Theatre opened on 5 July 1920, and became a listed building in 1993. Offers a diverse programme of events. A wheelchair lift allows for easy access to the foyer, bars and toilet facilities. www.palacenewark.com. Location: In the centre of Newark. Attenborough Nature Centre, Barton Lane, Attenborough, Nottingham, NG9 6DY. Tel: 0115 972 1777. A haven for wildlife. Education, Visitor & Conference Facilities. The Nature Centre is entirely on one level with all rooms fully accessible. Disabled parking spaces are approximately 100m from the entrance to the Centre. About 3 miles south of Nottingham. Nottingham Castle, Friar Lane, Off Maid Marian Way, Nottingham, NG1 6EL. Tel: 0115 915 3700. A magnificent 17th century mansion built on the site of the original Medieval Castle, with spectacular views across the city. Castle Cave Tours. Nottingham Castle is 10 minutes walk from Nottingham City centre. Newstead Abbey, Newstead Abbey Park, Ravenshead, Nottinghamshire, NG15 8NA. Tel: (01623) 455 900. Newstead Abbey is a beautiful historic house set in a glorious landscape of gardens and parkland within the heart of Nottinghamshire. The Abbey's most famous owner was the poet, Lord Byron. www.newsteadabbey.org.uk. About 8 miles north of Nottingham. White Post Farm Centre, Farnsfield, Notts. NG22 8HL. Tel: (01623) 882977. Awarded Visitor Attraction of the Year (over 100,000 visitors) in the East Midlands Tourism Excellence in England Awards. A great day out for all of the family! Come along and make friends with over 3000 animals from the instantly recognisable to the more unusual including meerkats, llamas and wallabies. www.whitepostfarmcentre.co.uk. About 10 miles north of Nottingham. Papplewick Pumping Station, off Longdale Lane, Ravenshead, Nottinghamshire, NG15 9AJ. Tel: 0115 963 2938. A late Victorian waterworks with James Watt beam engine in ornate engine house with intricate brasswork and stained glass windows. Engines are steamed at Bank Holidays and other selected weekends. www.papplewickpumpingstation.co.uk. About 8 miles north of Nottingham. White Post Farm Centre, Farnsfield, Notts. NG22 8HL. Tel: (01623) 882977. Awarded Visitor Attraction of the Year (over 100,000 visitors) in the East Midlands Tourism Excellence in England Awards. A great day out for all of the family! Come along and make friends with over 3000 animals from the instantly recognisable to the more unusual including meerkats, llamas and wallabies www.whitepostfarmcentre.co.uk. About 5 miles south of Ollerton. Papplewick Pumping Station, off Longdale Lane, Ravenshead, Nottinghamshire, NG15 9AJ. Tel: 0115 963 2938. A late Victorian waterworks with James Watt beam engine in ornate engine house with intricate brasswork and stained glass windows. Engines are steamed at Bank Holidays and other selected weekends. www.papplewickpumpingstation.co.uk. About 6 miles south of Ollerton. Boughton Pumping station, near Ollerton. Tel: 01623 862366. Boughton Pumping station is a magnificent Edwardian Grade II listed building. It was built at the beginning of the 20th century and supplied three million gallons of clean water to homes each day. Includes power exhibition and Heritage Exhibition. On the outskirts of Ollerton. Rufford Country Park, Ollerton, Nottinghamshire, NG22 9DF. Tel: 0845 330 4214. Located near Ollerton and Sherwood Forest, this 150 acre park is one of Nottinghamshires most popular visitor attractions. Parkland, 12th century Cistercian monastery, country house, gardens, craft centre and shop, gallery exhibitions, lake, Victorian-style Restaurant, or browse in the Craft Centre Shop. www.ruffordcraftcentre.org.uk. About 6 miles south of Ollerton. Captain Jacks Adventure, Chancery Lane, Retford, DN22 6DF. Join us aboard Captain Jacks Adventure for family fun at Retford's indoor soft play centre. We offer great food, family fun, toddler sessions and fantastic children's parties! Open seven days a week we provide a safe fun environment where children can play and parents/carers can relax in comfort and enjoy quality food and drink from our café. With a separate toddler and junior soft play area we are able to provide a safe exciting play experience for all under 13s. Tel: 01777 869966. www.captainjacksadventure.co.uk. In the centre of Retford. Sherwood Forest Country Park, Edwinstowe, Near Mansfield, Nottinghamshire Tel: 01623 823202. Sherwood Forest was formerly a royal hunting forest, favoured by Norman kings, and was also the legendary home of the worlds most famous outlaw, Robin Hood. About 9 miles south of Retford. Rufford Park, Ollerton, Nottinghamshire NG22 9DF Tel: 0845 3304214. Rufford Park can be found on the outskirts of Sherwood Forest in Nottinghamshire, and is one of the countys most popular day's out. There is plenty to see and do, with the centrepiece being the remains of a 12th Century Cistercian abbey; around the ruin is 150 acres of gardens and woodlands, and there is also an excellent craft centre, showcasing the skills of local artists with exhibitions and demonstrations. (photo). About 10 miles south of Retford. Clumber Park The Estate Office, Clumber Park, Worksop, Nottinghamshire S80 3AZ. Tel: 01909 476592. Clumber Park (photo) is a country park in the Dukeries near Worksop. Idyllic lakeside walks in the pleasure ground. Bring your own, or hire a cycle and explore our woodland trails. Clumber Chapel - a Gothic cathedral in miniature. Culinary tastes of the past come to life in the Kitchen Garden. About 6 miles southwest of Retford. Retford Little Theatre, Wharf Road, Retford, Nottinghamshire, DN22 6EN. Tel: 01777 702002. Founded in 1941, Retford Little Theatre is an amateur drama group, housed in its own purpose-built theatre, generously provided by Bassetlaw District Council. The Box Office opens on the Friday evening one week before each production. In the centre of Retford. White Post Farm Centre, Farnsfield, Notts. NG22 8HL. Tel: (01623) 882977. Awarded Visitor Attraction of the Year (over 100,000 visitors) in the East Midlands Tourism Excellence in England Awards. A great day out for all of the family! Come along and make friends with over 3000 animals from the instantly recognisable to the more unusual including meerkats, llamas and wallabies. www.whitepostfarmcentre.co.uk. About 5 miles west of Southwell. Southwell Minster, Bishop's Drive, Southwell, Nottinghamshire. Tel: 01636 812649. A superb Minster Church and Cathedral with a history going back almost a thousand years. The Norman nave is said to be one of the finest in Europe. See the new "Angel Window", search for 10 mice carved by Robert Thompson, visit the Chapter House to see the famous "Leaves of Southwell" and carvings of dogs, rabbits and pigs hidden in the foliage. The Southwell Minster Centre incorporates the Minster shop and Refectory, with audio visual display and Exhibition. www.southwellminster.co.uk. Location: In the centre of Southwell. Southwell Racecourse, Rolleston, Southwell, Newark, Nottinghamshire, NG25 0TS. Tel: 0870 220 2332. The All Weather Track - The Fibresand track is a left handed oval of 1 mile 2 furlongs. The Turf Track - The turf course, used for both National Hunt and flat racing, lies within the all weather track. www.southwell-racecourse.co.uk. About 2 miles east of Southwell. Newstead Abbey, Newstead Abbey Park, Ravenshead, Nottinghamshire, NG15 8NA. Tel: (01623) 455 900. Newstead Abbey is a beautiful historic house set in a glorious landscape of gardens and parkland within the heart of Nottinghamshire. The Abbey's most famous owner was the poet, Lord Byron. www.newsteadabbey.org.uk. About 6 miles west of Southwell. Papplewick Pumping Station, off Longdale Lane, Ravenshead, Nottinghamshire, NG15 9AJ. Tel: 0115 963 2938. A late Victorian waterworks with James Watt beam engine in ornate engine house with intricate brasswork and stained glass windows. Engines are steamed at Bank Holidays and other selected weekends. www.papplewickpumpingstation.co.uk. About 6 miles west of Southwell. Newstead Abbey, Newstead Abbey Park, Ravenshead, Nottinghamshire, NG15 8NA. Tel: (01623) 455 900. Newstead Abbey is a beautiful historic house set in a glorious landscape of gardens and parkland within the heart of Nottinghamshire. The Abbey's most famous owner was the poet, Lord Byron. About 4 miles south of Sutton in Ashfield. Captain Jacks Adventure, Chancery Lane, Retford, DN22 6DF. Join us aboard Captain Jacks Adventure for family fun at Retford's indoor soft play centre. We offer great food, family fun, toddler sessions and fantastic children's parties! Open seven days a week we provide a safe fun environment where children can play and parents/carers can relax in comfort and enjoy quality food and drink from our café. With a separate toddler and junior soft play area we are able to provide a safe exciting play experience for all under 13s. Tel: 01777 869966. www.captainjacksadventure.co.uk. About 6 miles east of Worksop. Mr Straw's House, 7 Blyth Grove, Worksop, Nottinghamshire S81 0JG. Tel: 01909 482380. Fascinating collection of household items, costume and memorabilia. National Trust. Charges apply.